Discussion in 'Stock Market Today' started by T0rm3nted, Jan 10, 2017. Hi everyone. 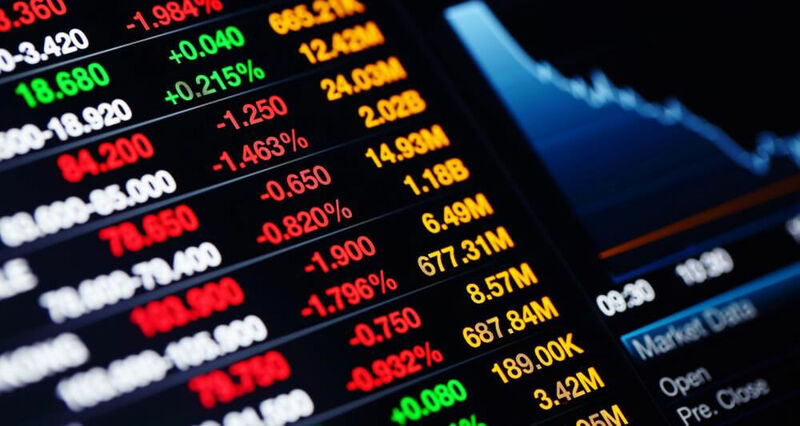 @bigbear0083 and I were talking and think it would be a cool idea to have a big database of stocks that everyone is watching. That would mean you could be invested in it, watching for entry, or just interested in it in general. This would make it easy for anyone to quickly see who is interested in a specific stock if they are posting about it. I, or anyone else, could then very easily post some information about a stock and see if I should tag anyone so they can get a notification that something has been posted about their stock (earnings, dividends, insider trading, anaylst upgrades, etc.). Obviously most people see that a thread has been posted in, but they don't see a lot of the more "generalized" threads that could have information on their stocks. 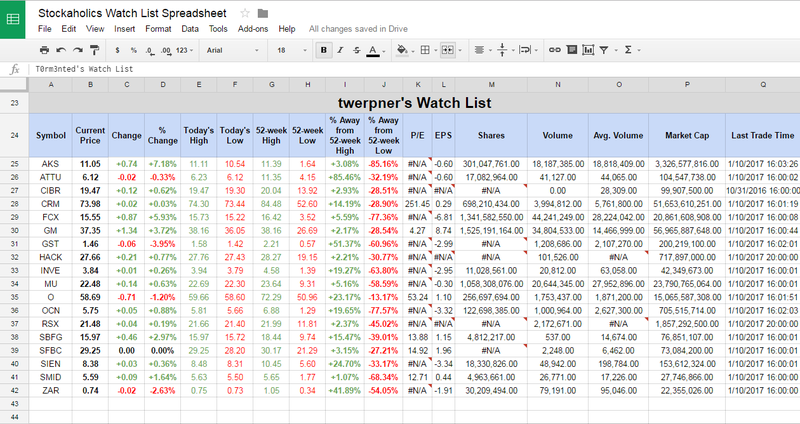 @bigbear0083 and I will keep a google spreadsheet updated with a list of stocks, and the people who are watching them. You can post in this thread all the stocks you are watching, and we will add you to the database. If you want to be removed from any stocks at any point, you can post your updates in here as well so we know. Ciao (Sheppy), OldFart, Shirley Sue and 1 other person like this. I'll take a shot at this. I am in some of these plays, and others waiting for entries. OldFart and T0rm3nted like this. Awesome. Thank you for creating this thread @T0rm3nted! I have a feeling this thread will be quite useful for members here. It's this kind of stuff that'll draw people back to Stockaholics imo. I haven't personally seen any other stock community board that offers this kind of dedicated content for its members. @T0rm3nted has really done an absolutely phenomenal job with updating all the earnings, dividends, analyst up/downgrades, insider trading, ipo's, you name it! and on a daily basis! Anyway, we'll have the spreadsheet up here for you guys very soon! I'm actually just now logging in for the first time this afternoon after experiencing some network issues for most of the day. Keep those watch lists coming! Great idea guys, just curious how it's going to work exactly. Will you be going to the database and manually tagging members for a specific stock or is it automated somehow? OldFart, Austin vanderweide and Tiptopptrader like this. @Z0da the master database spreadsheet is a work in progress atm ... but it's getting close. OldFart, Ken34 and twerpner like this. Hi everyone. @Cy McCaffrey and I were talking and think it would be a cool idea to have a big database of stocks that everyone is watching. That would mean you could be invested in it, watching for entry, or just interested in it in general. This would make it easy for anyone to quickly see who is interested in a specific stock if they are posting about it. I, or anyone else, could then very easily post some information about a stock and see if I should tag anyone so they can get a notification that something has been posted about their stock (earnings, dividends, insider trading, anaylst upgrades, etc.). Obviously most people see that a thread has been posted in, but they don't see a lot of the more "generalized" threads that could have information on their stocks. 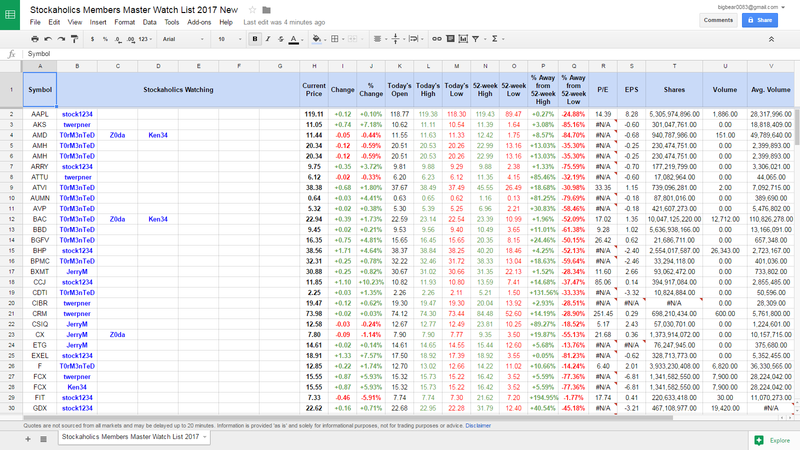 @Cy McCaffrey and I will keep a google spreadsheet updated with a list of stocks, and the people who are watching them. You can post in this thread all the stocks you are watching, and we will add you to the database. If you want to be removed from any stocks at any point, you can post your updates in here as well so we know. BEST IDEA EVER!! THUMBS UP!! WOW cy that is freaking amazing, i bow down to you 2, to put in that much effort is amazing, thanks really for this. To add to what @Cy McCaffrey mentioned, we're still working on this. Cy did a much better job setting it up than I would have! I was just honestly going to make a 2-column spreadsheet with the Ticker Symbol and then the 2nd column would have a list of the people watching it. I may still make that one in his spreadsheet so that I can just CTRL + F to find a ticker symbol when I'm posting about something, and get a much quicker list of the users on this site that are watching it. If anyone has any suggestions, just let us know and we'll see what we can do! Here's my latest version of our members master watch list as of this morning. I completely revamped what I was working on last night as that version was a little cumbersome. This newest version basically has the 2 columns (ticker symbol/members watching) right next to each other, as well as all of the additional live real-time data to the right. Let me know what you guys think of this one. These are all sorted by ticker symbol A-Z. <-- Click there to open. Excellent @Cy McCaffrey! Great work! This will be extremely helpful. I created individual stock threads for ALL of the stocks that we are all watching if they did not exist. Hopefully we can all create some discussion in them when we are watching them and/or have any thoughts on them. These are the kind of things that will bring more people to this site and keep them interested. We will also learn more as people see threads of discussion and start posting their thoughts/insights/analysis on those stocks as well. It really benefits us all. A perfect example is @Tiptopptrader who we all know is watching/invested in certain stocks, and we know he's an expert on them so when he posts, it intrigues us. Lots of people start posting in threads he's active in because he has regular thoughts on them. Hopefully we can all do the same. If anybody else has any stocks they're watching, feel free to post them here! Anyone else for a watch list? As @T0rm3nted said if there's anything that you guys are actually invested in, or are just simply watching or have a general interest in, post your list in here and we'll get it added to our members watch list spreadsheet! Also just gotta say but awesome thinking there in starting up all the stock threads that within the members watch lists here @T0rm3nted. You never cease to amaze. Great work! twerpner and T0rm3nted like this. Might also be a good idea to post all of your new threads that you created in here as well @T0rm3nted for an easy one-stop shop access because they will fall off the top of the front/forums page at some point and some might miss 'em. Obviously they can all be found via a simple "search" but figured to put them all in here as well. All of the follow thread links below are "clickable" and will take you to their respective discussion threads each. SID - Companhia Siderurgica Nacional (ADR). There are obviously others like AMD, BAC, etc. but those threads already exist. Alexander Gray and T0rm3nted like this. If anyone's interested I'm going to be keeping that first spreadsheet that I had posted late last night in here as well. I figured we could have both of these running instead of just the master database spreadsheet. 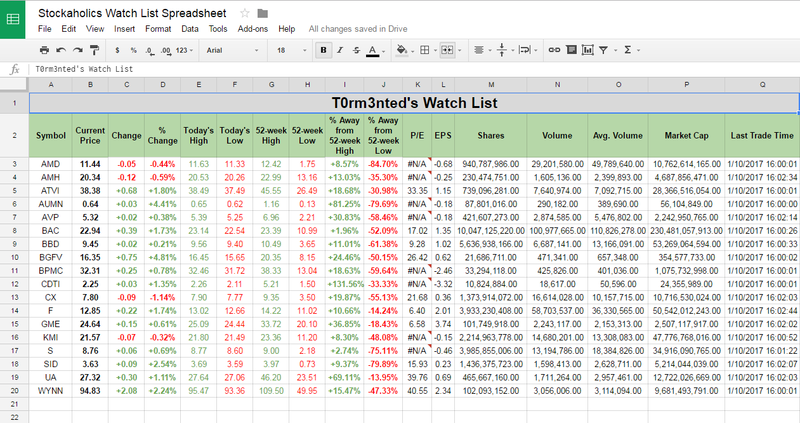 The reason this one is nice is because you guys are all able to view at a glance everyone's watch list in one spot. 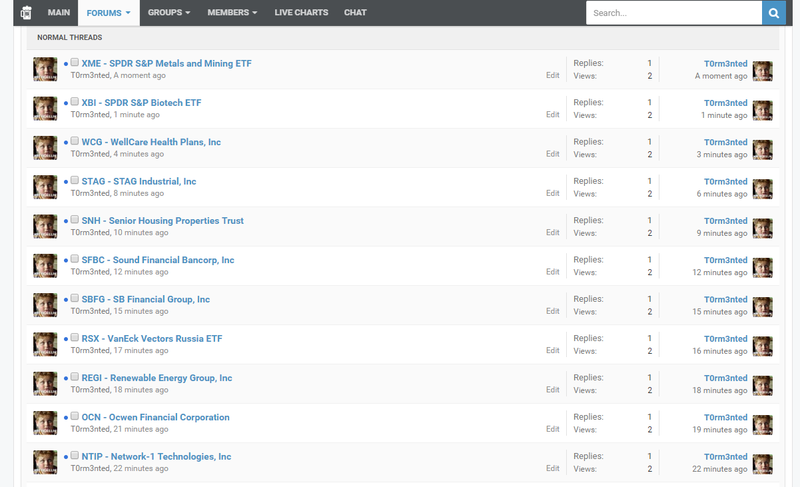 You can see how everyone's stocks are performing in real-time in each respective members watch list. Here are @Ken34 & @Andre watch lists. Andre and T0rm3nted like this. I made a typo, should be ELP instead of EPL. Adding my watch list in here as well. Hope everyone who frequents Stockaholics can get a chance to chime in here with their watch list. The more the merrier!